Don’t spend huge sums on marketing and research without devoting time and training to Customer Service. Utilize and train the 15 FREE facets of customer service to become a star in your business without going broke. Always remember that Customer Service Is FREE! Earn money by promoting and selling Customer Service Is FREE. One of the most effective, basic and simplest training tools is a quick pre-shift meeting, rally, note, video or handout. It will take just moments of preparation and less than 5 minutes to implement. - Flip through Customer Service Is FREE and stop at any given page. - On every page in the book there are phrases that are called out. Use a phrase from the page you stopped on to be the topic of your daily training. - Discuss this among your customer service staff members or print it out on a sheet a paper with some relevant key points as they relate to your business. Corporate America spends millions upon millions of dollars on marketing and promotion but often overlooks the importance of customer service. Excellent service produces immediate results with no additional cost. 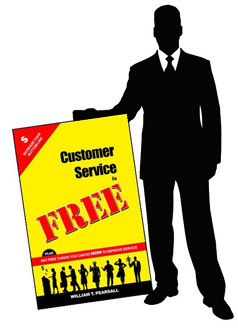 This book teaches FREE and practical principles that can be implemented NOW to improve customer service. Filled with FREE exercises, examples, worksheets, awards, tips and tools, let this book be your guide to excellence. Exceptional customer service is FREE and starts with you. Raise the bar! Your customers will thank you. Your competition will envy you. Your boss will appreciate you. Your employees will respect you! FREE is a great place to start!